In 1941, at least 33,771 Kyiv Jews were shot by the Nazis on Sept. 29 and Sept. 30, in the Babiy Yar ravine of Ukraine's capital. Some 60,000 more Kyiv residents and POWs were killed there in the following months. Yesterday, nearly 1,000 guests from 41 nations - including the Israeli president - gathered at the Babiy Yar memorial to commemorate the 65th anniversary of the massacre. A number of bloggers marked the anniversary, too. And the morning was sunny. The sky was blue, with just a little bit of white here and there. The grass was green, and the leaves were just beginning to turn yellow. A beautiful morning, all in all. It would've been nice to go to the park, walk on the few leaves, still precious, dance on the grass... Nice. Cold air almost burns you in the shadow, but as you move into the sun, it's like a hand on your face, not a slap, but a tender touch. I don't know about 65 years ago - maybe the morning was beautiful, too. Sunny. Warm... It's warmer in Kyiv in general. Or maybe not. And, perhaps, they didn't care about nature. They didn't care about anything. They were busy. They were being killed. Exactly 65 years ago, my grandfather was killed, the grandfather I've never known. My father almost never talked about him. All I've been told about grandfather were the two words - Babiy Yar. And also, with a sigh - "Must've been the neighbors who turned him in." A couple Ukrainian bloggers chose not to dwell on the tragic history and insted posted their observations on the official ceremony and the obstacles it has created for some. When I ran into our esteemed [president Yushchenko] at the [Kyiv antiques market], there were five bodyguards around him. People were coming up to him, took pictures, some asked him for an autograph. When the president came to see the lilacs in bloom at the Botanical Garden, he was guarded by 5-10 people, too. Even [a local paper] did a story on that. But today, Babiy Yar was completely cordoned off. [...] Policemen every two meters. Plus some plainclothes men, armed [...]. About a hundred guards. People used to walking through the park were politely asked to take a detour. 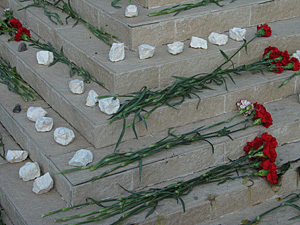 I've a strange feeling about the anniversary of the Babiy Yar tragedy. I can't say that the air is filled with holiday atmosphere. But there is a feel of a "Solemn Event" that everyone is waiting for and approaching with much responsibility. [...] Like, we came to a police department (to resolve a very important matter). Something unusual could be felt at the entrance. A lower-ranking officer stood bending down in front of the open door, shining his shoes. The highest-ranking officer appeared by the door [...] - a sharp-looking brunette in a luxurious suit, smelling of an expensive perfume, his hair combed neatly. [...] We are on our way out now, he said. Off to an event. In Babiy Yar. We don't know when we're going to be back - most likely, we won't be back at all. Come back tomorrow. And he smiles such a pleasant smile... And right away it feels that the whole city is celebrating.